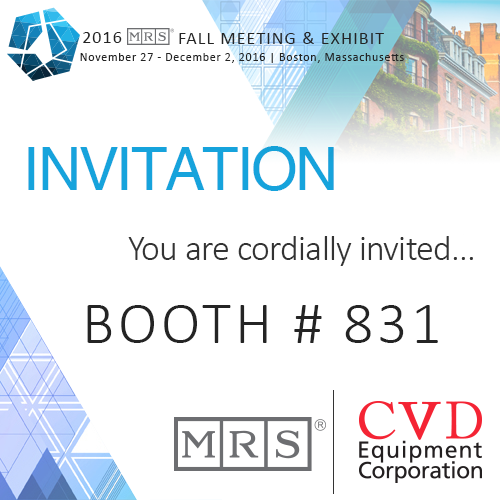 CVD Equipment Corporation, Booth #831 , cordially invites you to attend the exhibit held in conjunction with the MRS Fall 2016 meeting this fall in Boston, Massachusetts. MRS has long been known as a great meetings society—serving as a major international stage for the examination of current and emerging materials research. Tuesday, November 29 | 11 a.m.–5:30 p.m.
Wednesday, November 30 | 11 a.m.–5:30 p.m.
Thursday, December 1 | 10 a.m.-1:30 p.m.